We live in one of the most beautiful parts of Australia. Uninterrupted vistas of lush green forests, cascading waterfalls, crater lakes, rivers flowing through ancient rainforest, mountain peaks and rugged gorges… Welcome to the Wet Tropics in Far North Queensland. The Wet Tropics Region stretches for 450km along the northeast coast of Australia. It was inscribed as a World Heritage Property on December 9th, 1988. In Tropical North Queensland we are lucky to have two World Heritage areas side by side: The Wet Tropics and the Great Barrier Reef. Some visitors are surprised at how green and lush the area is as they view Australia mainly as a desert with a few big cities. What they find here stretches far beyond their expectations. World Heritage Sites are listed because their conservation and preservation is very important for the whole world. The Wet Tropics rainforests descended from the forests of Gondwana, a landmass that formed around 300 million years ago which Australia was part of. About 180 million years ago Gondwana started to break up into continents we know today and slowly drift apart. Australia maintained the longest contact with Gondwana and its ancient rainforests. 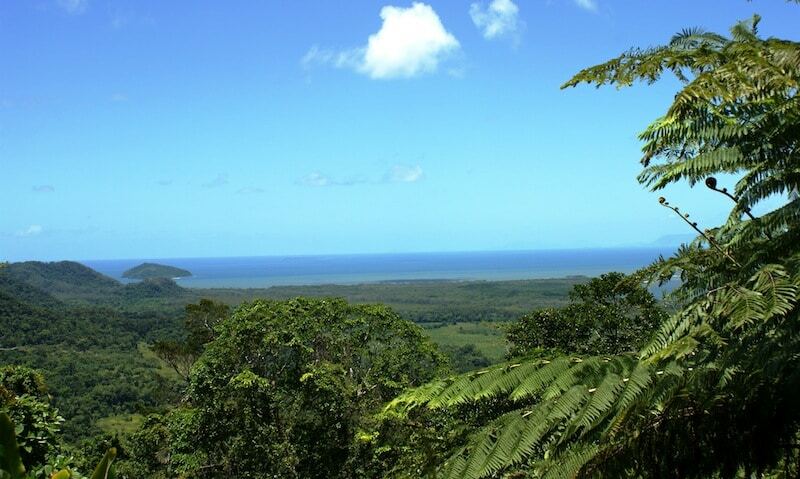 The remaining pockets of Far North Queensland rainforests are the oldest surviving rainforests in the world. Through the millions of years they managed to withstand dramatic climate changes and significant cooling that the world went through. Hence they represent a major stage of the earth’s evolutionary history. Entering the Wet Tropics you enter a living museum, almost a complete record of the evolution of flora on earth. Being a hotspot for biodiversity you will find the world’s highest concentration of primitive flowering plants here. One of them, the rare Ribbonwood tree also known as “idiot fruit” is considered the “green dinosaur” as it goes back to the time when dinosaurs roamed the earth. It was thought to be extinct when the tree was accidentally rediscovered in 1971 in the stomachs of dead cattle that ate the fruit. This is how the fruit was discovered to be highly toxic. Another “dinosaur” walking these forests is the cassowary, a large flightless bird whose evolution goes back to the time when Australia was still part of Gondwana. Found only in this part of the continent and parts of Papua New Guinea, the cassowary is considered endangered and is under protection today as it plays a major role in maintaining the rainforest. Dwelling on the ground is the smallest and most primitive member of the macropod family Musky Rat-kangaroo and hiding high in the canopy the rare, endangered and elusive Bennett’s tree-kangaroo. In fact, there is a lot of wildlife to be seen in the Wet Tropics and many of the species of flora and fauna found here are endemic to this area meaning they do not live anywhere else. Discover this for yourself on a rainforest tour in Far North Queensland. When visiting Cairns one of the highlights is to take a day trip to the Daintree National Park. Experience the beautiful coastal drive, the lookouts, the rainforest and the many activities on offer. When on your Daintree tour experience a crocodile cruise with one of the local operators. Keep an eye out for yet another “dinosaur” local to this area, the Estuarine or Saltwater crocodile. On a recent Cairns to Cooktown tour we stopped at the Daintree National Park and were extremely lucky to find a baby tree-kangaroo on our path, either lost or abandoned by its mum. As mum was nowhere to be seen we took the little guy and dropped him off at the Tourist Information Centre from where he was picked up by a caring lady with the right formula to feed a baby kangaroo and willingness to carry him in the “pouch” until Animal Rescue team arrive. A visit to Daintree National Park and Cape Tribulation can be a day tour or extended trip along the Bloomfield to Cooktown, Lakefield National Park and Quinkan Gallery in Laura, combining the beautiful nature with Aboriginal and European history. No Limit Adventures can tailor a tour based on your expectations.